I am the mother of three young children including our young daughter Hannah who has severe asthma. Our journey through her chronic illness has led us to take a natural approach whenever possible and we find this an effective approach for our entire family. Similasan proudly offers homeopathic solutions to parents in North American which have been used for over 30 years by families in Switzerland. I was immediately drawn to Similasan products which are 100 percent natural and are also dye-free. The body has a wonderful natural ability to heal itself and the goal of Similasan is to help boost that process with supportive formulas. My son, Adam recently complained that his eyes were bothering him after swimming in our pool and described the symptoms as feeling scratchy and itchy. I noticed that his eyes were very red and watery so we used Similasan’s Kids Irritated Eye Relief and I added a few drops to each eye as directly. Within 30 minutes, he said that his eyes felt much better and went back to playing contentedly with no further complaints of irritation. Another frequent complaint that I get because we are always in the pool over the summer is that their ears are clogged. 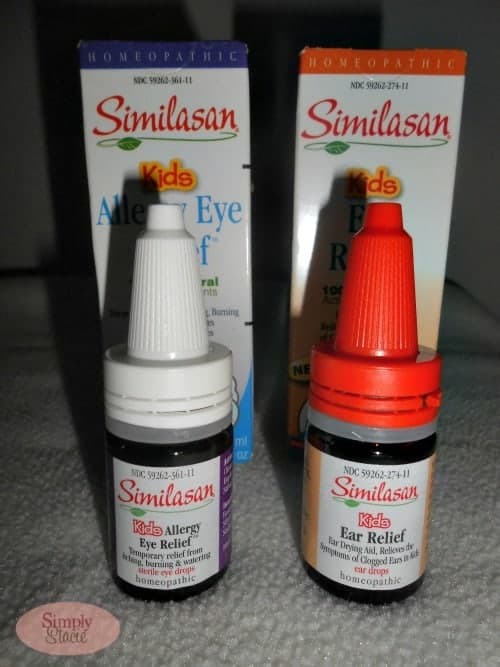 Our go to product is Similasan Kids Ear Relief and it has worked really well to lessen that uncomfortable sensation of trapped water in the ear. Even my husband and I use this product as needed in our own ears and I am very pleased with the results. Do your children suffer from allergies? If so, the Kids Allergy Eye Relief may help with symptoms of burning, itching, redness and watering associated with common allergies such as pet dander, pollen etc. My daughter likes that this product does not sting or burn when I put the drops in her eyes and she said it feels soothing. We are dreading the start of cold and flu season because it is especially dangerous to Hannah’s lungs. 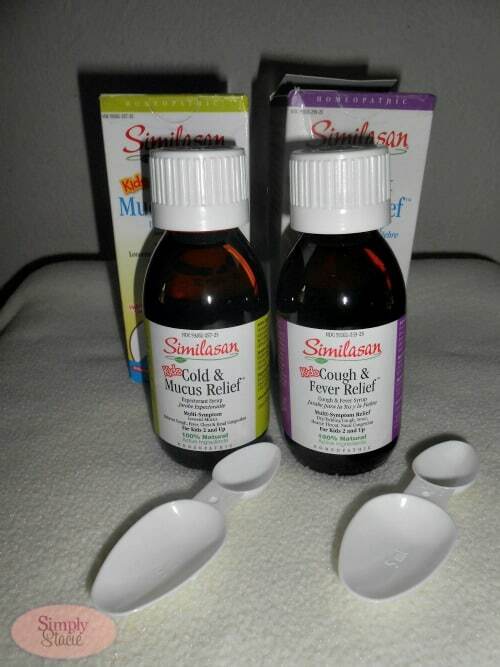 I plan to stock our medicine chest with Kids Cough & Fever Relief and Kids Cold & Mucus Relief. I like that I can use these products to help lesson and relieve symptoms in my normally healthy boys and as supportive therapy in conjunction with her traditional medicine for Hannah. Similasan is free of all the things that I don’t want to see in my family’s medicine including alcohol-free and dye-free formulas that taste great too! You are invited to visit Similasan to learn more about all of the homeopathic formulas for children and find a location nearest you that carries the product line. I love this for myself & children. I learned there is a Computer one. I like that they provide a complete description of each ingredient. I like the ear drops. I like that the Nasal Allergy Relief ™ is gluten and diary free. I like the all natural ingredients. I would buy these for my granddaughter. products are also available in Canada. Stress and tensions relief for me is much needed please! I’d love to try that one!